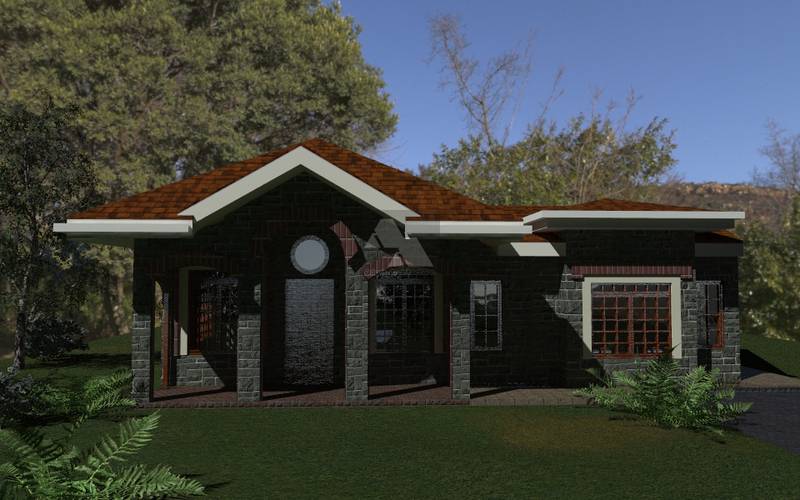 This is a 3 bedroom home design for a bungalow that is well suited for a 50x100foot plot (one eighth of an acre). The design of the house lends itself to the street front orientation, allowing two vehicles to park within the garage or carport with ease. The chimney works with the entrance porch to define a great entrance area. The main living room also faces the front, with nice grilled doors allowing for opening up of the living room opening up into the front yard. The dining room also opens up to a patio to the rear. . Overall Dimensions – 16meters by 13 meters. The beauty of this plan is that due to its size and configuration, it is easy to build incrementally and cost effective to achieve, and can be achieved within 3.5 to 4 million Kenya shillings. Thank you very much Tariq. I appreciate your compliment. Very good plans you have. Thanks for your kind compliments Duncan. Excellent design for me.Looking forward to putting it up. Nice one David, how much does it cost for the above design. That work is fantastic. How much does the design cost? You have an email with all the details. Thanks for getting in touch. 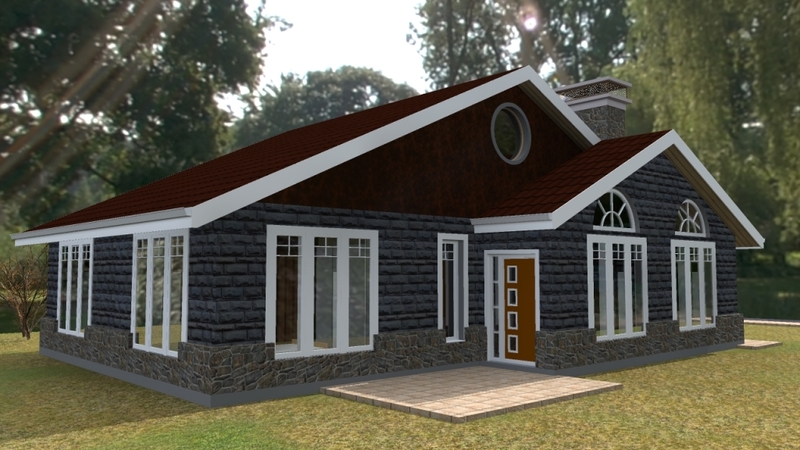 I need a house plan for a 3 bedroom bungalow in Ruiru on a 50*100, what is the cost for the plans .My budget is 3m to completion. Kindly also advise the cost and space difference of doing a 1storey mansion. Check your inbox for all the details and thanks for getting in touch. All details sent to your inbox. We look forward to hearing from you. It was great talking to you. Looking forward to working together. Nice design David.how much does this plan goes for? I have emailed you all the details. Thanks for getting in touch! I have send you all the details via email. Kindly check and revert. Check you email for all the details and thanks for getting in touch. Great works there David. Kindly send me more details about this plan and other samples for a 3 bedroom house. I have sent you details via your email. 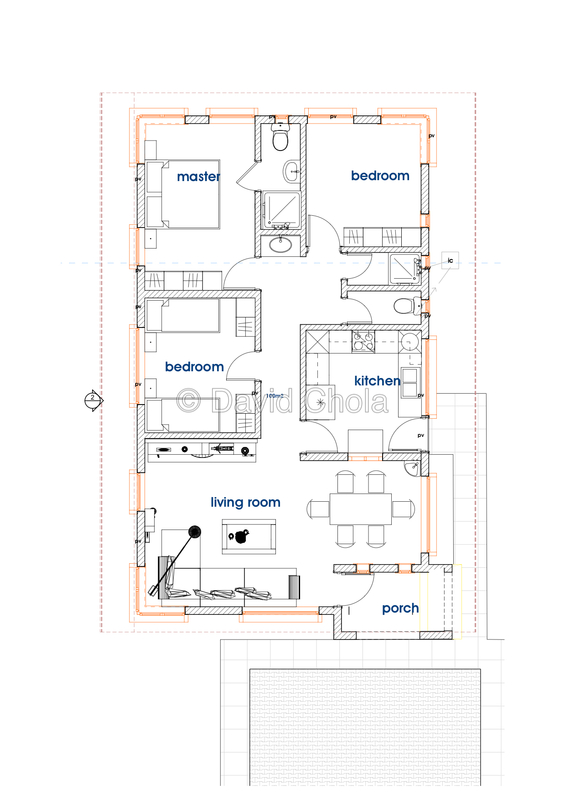 You can browse through our House Plans section on the website to see more house plans. We have different ones that can fit your needs. Yes you can build your house using burnt blocks. The important thing is to ensure that the blocks are baked properly. It is also possible to construct a home on a low budget. All you have to do is use cost saving ideas and build one room at a time. It will take you longer, but you will eventually get to your goal of having home. Thank you for getting in touch. Call us or visit our offices and we can guide you through the entire process. I have sent you our contacts and office via email. I love the design. How much is all costs? Yes indeed this is simple and elegant design that can work for you. Good morning. I have a similar question as above. What is the cost of building a 3 bedroom house using this plan and do you have other house plans for affordable housing (Low budget)? Kindly advise. There are a few ways to bring down the cost of your construction. •	Build your home in phases e.g. work on the structure first and do finishes slowly, one room at a time. I have emailed your more details. I hope the info above helps. Hi David, kindly drop me a mail on the cost of this house plan and if its possible to use ISSB. I need a three bedroom plan that can fit on 40*60 piece of land. Kindly send me the options you have. Here are links to a few house plans that can fit in your size of land. These are just a few of the house plans that can fit in your size of land. We have many more, and even when they are slightly bigger, they can be adjusted to work for you. All we need to do is identify what you like and embark on producing the drawing customized for you. The Institute of Quantity Surveyors gives a rate of between KES.25,000 and KES. 35,000 per square meter, depending on the finishes that you choose. So the final cost of your house will depend on the size and the finishes that you choose. For a unit of 130m2, you can budget between 3.25M-4.55M. Many other factors can also affect the total cost including location, cost of labor, cost of materials, using a contractor or building for yourself etc. You also need to budget for professional services (Architectural, Structural, Quantity Surveyor’s, Service Engineers) etc as well as supervision during construction and getting the relevant government approvals. Hi David, I sent you an enquiry on 12th December, 2016 and I am yet to receive your reply. Still anxiously awaiting your response David. Check your email Noah. Sorry for the delayed response. Hi David, i intend to put up a simple 3 bedroom(master) in my village.I plan to begin it in Jan first week but i realize i need a plan?…how can you be of help,and what are your charges? Hae i have this design in mind . Need finer architect details and coatings. How can I send you the photo. 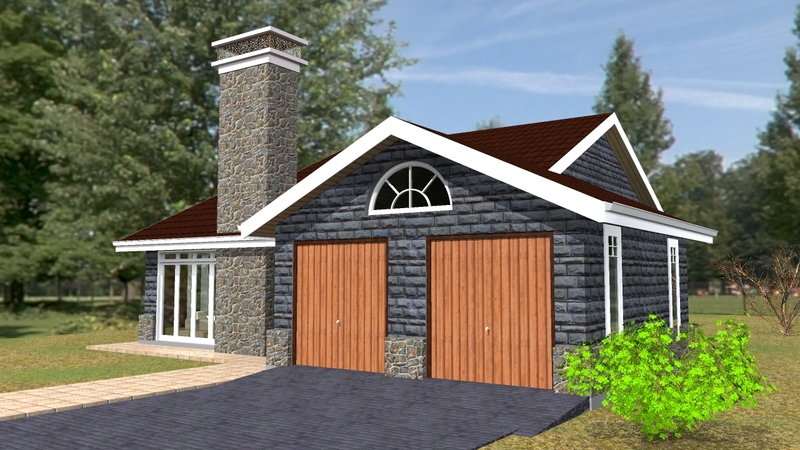 This particular house plan is 166m2, including the garage. 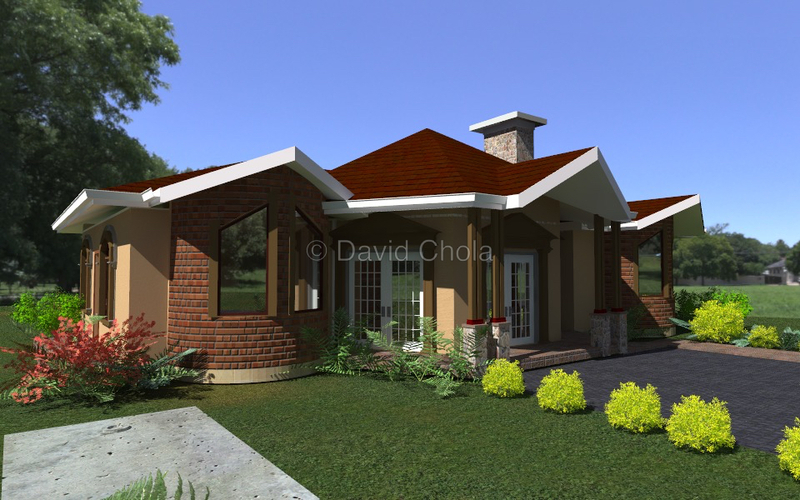 The standard cost of building currently is between KES 25,000 – KES 35,000 per square meter. 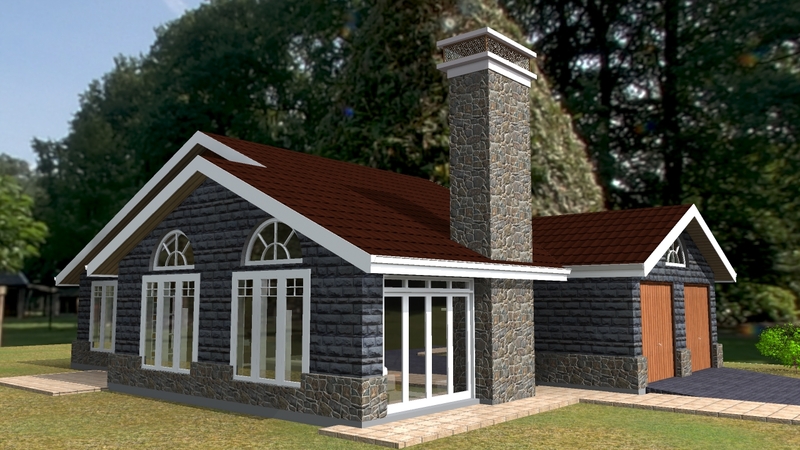 The cost of construction for this house plan using the standard stone and cement approach would cost between KES. 4.15M – KES. 5.8M. The rate varies depending on the finishes that you choose to use. Check your email for more details on how to get the house plan. Awaiting your response. Please send me your contacts via jscolukera6@gmail.com. i would like to know the cost of this design. I have responded with all the details via email. I await your kind response and from there we can indeed get the ball rolling. We can make adjustments to the house plan to have only one car port at no additional cost. Kindly check your email for all the relevant details. thanks david for the design. It appears fabulous. i am just wondering if it can be modified to include an extra bedroom making it 4 Br. And now with 4Br how much area is likely to remain not built-up. All our plans can be modified to fit the needs of our clients. Everyone is different and so we always strive to ensure that we meet each individual need. As for how much space will remain unbuilt, it will depend on the size of your property. Once I know the size of land you have, I can give you an answer on this. I have sent you an email with more details. Thanks for getting in touch. I have sent you all the details. We can adjust the plan to include a 4th bedroom as you have requested. Lets talk and work on the design. Thank you for getting in touch. I have forwarded all the details to your mail. I await your response. This is wonderful David.This is my idea of a real beautiful home.How do I get the design? How much is the cost?God bless. Thank you for getting in touch. Kindly check your email for all the details. I await your response. I would like to know your charges for architectural design for a simple and basic 3 bedroom sitting on an eighth of an acre. We can make adjustments to any plan to make it fit within your budget and your needs. With a budget of 1.5M, it really depends on the size of house and the finishes you choose. I really love your designs especially 3 bedrooms but i think four bedroom bungalow can be nice for me can you please see four bedroom plan and muster ensuite and standard measurements. Hi i intend to build a 3bd room house on 50*100 piece of land,my budget is 1M.kindly advice. There are many ways to bring down the cost of construction. You can take on the project yourself and save on paying a contractor. You can also use cheaper construction methods such as sand blocks, EPS panels etc. The other option would be to build your house in phases. Complete the structure with what you have and work on the finishes slowly as funds become available. You also need to factor in the cost of professional services if you decide to work with any. This is the cost of architectural services, Structural Engineer’s services, Quantity Surveyor, Services Engineer and the cost of getting government approvals if required, depending on your project location. Excellent dream houses am seeing here! I would like to get quotes and professional advice. Kindly check your email for our response. how much does it cost to build such a house? The main house of this plan is 126m2 with a separate 40m2 garage. 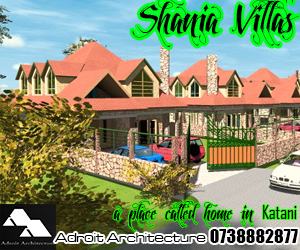 Using the rate provided above, it would cost you KES.3.15M-4.41M for the main house. This is a good guide that you can follow. Check your email for other details. 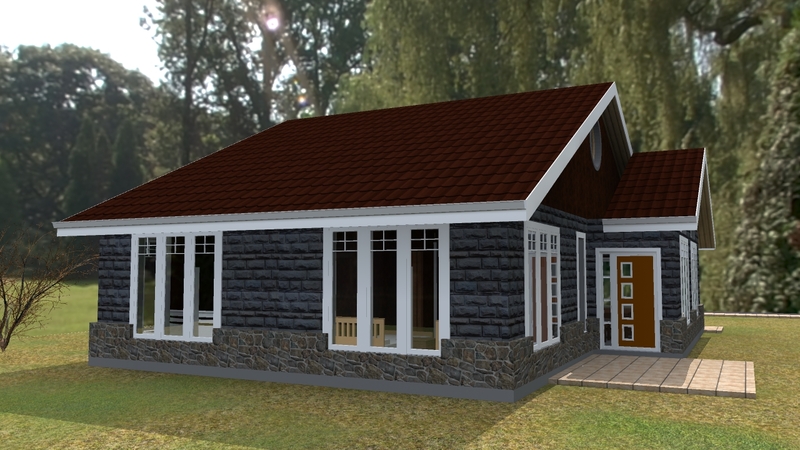 Is it possible to do a small three bedroom Bungalow on an area 75Sq Metre . Yes it is but the rooms will not be as big because of the space limitation. You can consider a simple maisonette that works way better when space is a limiting factor. How much would it cost me to do for design plans for a three bedroom house with a detached SQ in the village. 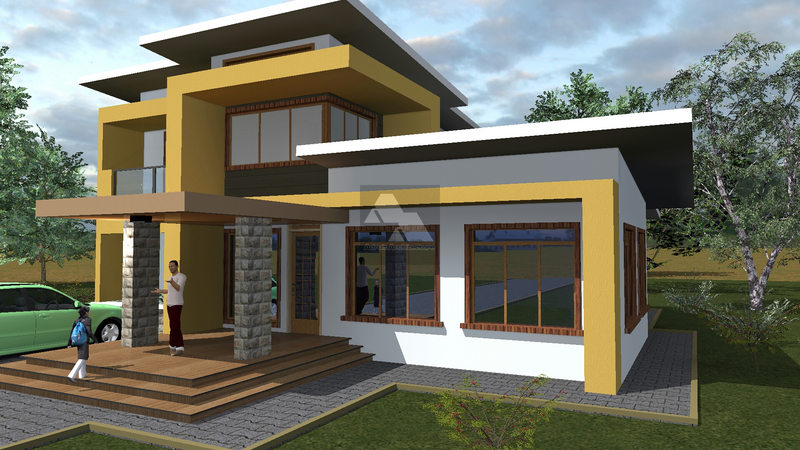 Yes, indeed we can design a great 3 bedroom house plan for you with a detached SQ. I have sent to you more details via email. 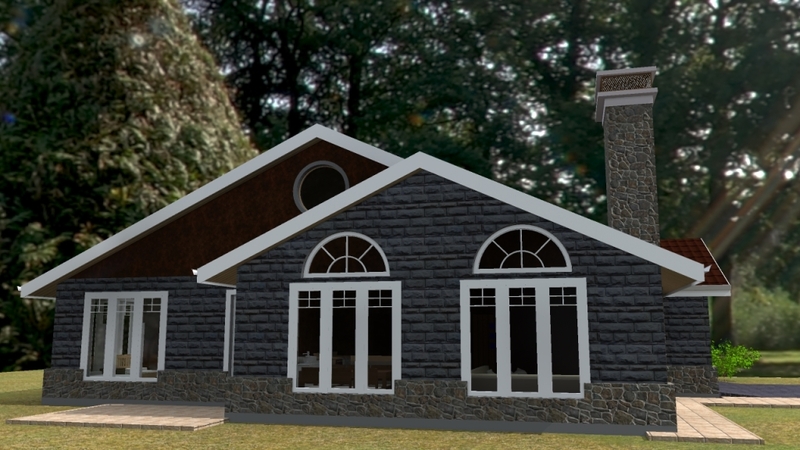 Do you have sample bungalow plans that can be done on a steep slope site. Any house plan can generally work on a steep slope. Its all about customization and orientation. I have sent you more details via email. I see that it would cost around 4.15- 5 m for this design. what if one chose to use EPS.. How much would that cost? 2. approximately how much would this cost Using EPS. I understand that the architectural designs etc are separate from the real house structure. Thanks David you guys are doing a great job. 1. On the EPS panels let me refer you to the companies dealing with them for better answers. 2. The shell would cost your about 70% of the total cost of construction. The other 30% would be for finishes which as you have stated, you can work out later room by room. This plan will fit perfectly on an eighth of an acre and leave enough room all around the house. A slight slope will not affect the house much. I have sent you more details via email. How much does this design cost? good stuff. kindly get back to on the cost of building such a house. The standard cost of building currently is between KES 25,000 – KES 35,000 per square meter, according to the latest published rated from the Institute of Quantity Surveyors of Kenya, depending on finishes and location of the project. 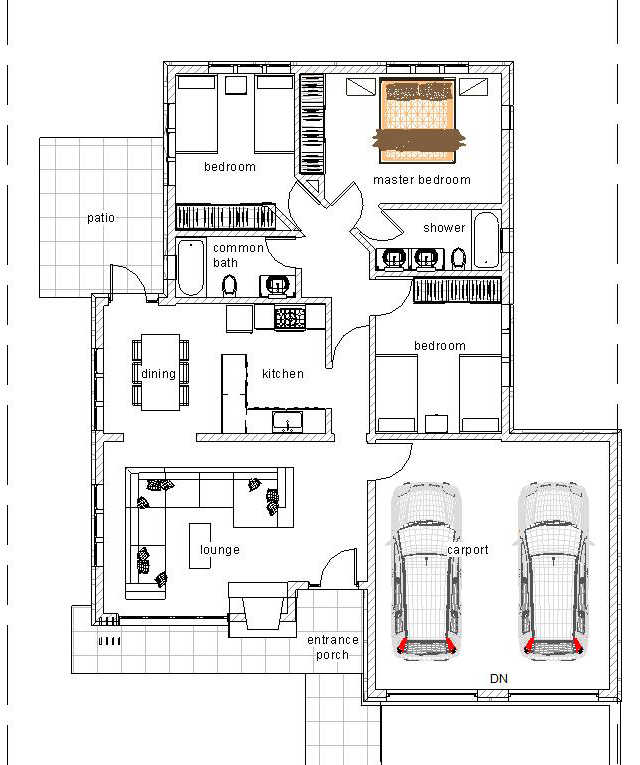 This house plan is 126m2 without the garage. Using the rates provided you can budget between 3.15M-4.41M. I have sent you the details for this particular house plan. 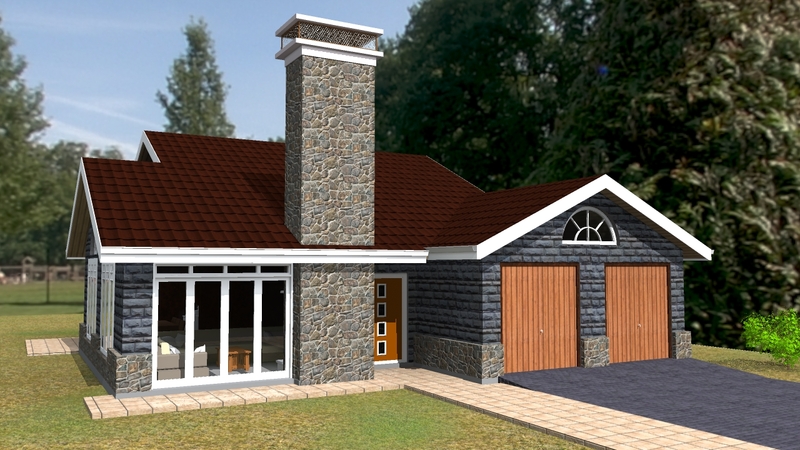 We can assist you to submit your drawings to the county government of Kiambu for approvals. How about if it is not signed? how much is it? Hey David. Great work you are doing right there! Kudos! I would appreciate if you would send me the costs for acquiring the above design? I have inboxed you all the details. In a nut shell, it works out to KES 7,500-12,000 per running meter of wall. For a 50*100 plot, you are working with 90 running meter of wall. So for your case, the construction cost be between 675,000-1.08M. These are estimate figures that you can work with. i like the design above. can i get more designs for an ⅛acre please. also, what other services do you offer in addition to designing and what are your charges? Check your email for all the details Vincent. Awaiting your response and thanks! I like this plan.Is it possible to get the same with all en-suite rooms? I prefer that and have a washroom at the entrance for guests instead. Kindly check your inbox for our detailed email. 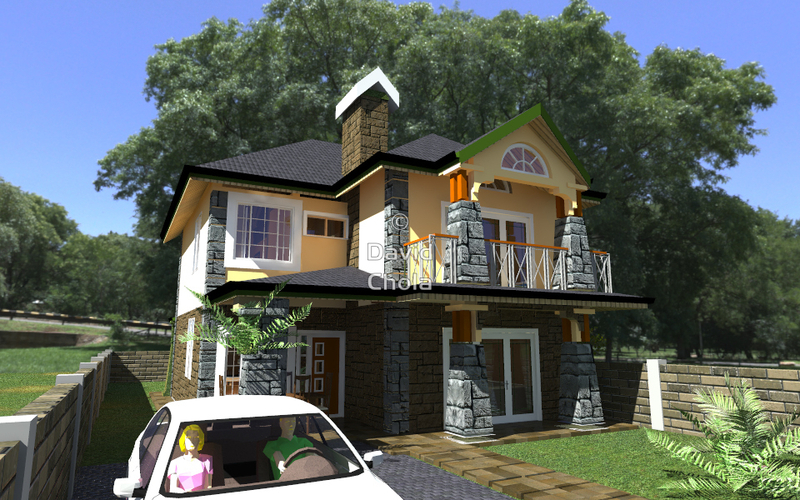 Am interested in a 3-bedroom house design to put up upcountry (Nyeri). How much do you charge for designs? Check your inbox Joseph. I have sent you all the details on 3 bedroom house plans. Looking to construct a four bedroomed bungalow in the 2nd half of this year. I have seen other interesting designs on here and I am now considering other designs. Guidance on costs please. I love this house plan. Cost? Does it come with architectural and structural blueprints? 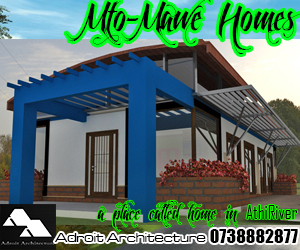 Kindly check your email for all the details on the Concise 3 Bedroom House Plans. I’ll start by saying “Great work!”, good to see clean, creative designs with nice space layouts and efficient use of space. Sample plans are pretty kool (well on paper). Can I please request some details send to my email on a design suited for my old parents in a village. Looking at affordable 3 large sized bedrooms, kitchen overlooking an open living lounge room/dinning area. Being in a village, we will be looking to construct a septic tank on the property. High ceilings will be great, with one attached carport and a perimeter of a covered patio. Looking forward to hearing ya professional response. A good house begins with a good design but a good design needs an good contractor to build it to spec. Our goal is not only to produce good designs but to work with our clients convert the design into beautiful homes. We have many successful stories on the same. Kindly check your email for all the details in response to your query. I await your response and thanks for getting in touch with us. 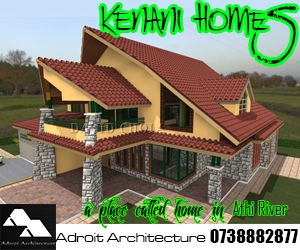 Kindly check you email for all the details on construction cost of 3 bedroom house plans. Kindly check your email for all the details. We await your response. I would like to put a simple 3bedroom ensuite bungalow. Can you please assist with the plan and costing? You can definitely build a beautiful home using bricks. You just need to ensure that the bricks are well baked to maintain the structural integrity of the building.